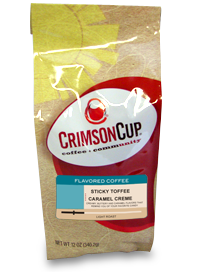 Crimson Cup is a company that sells delicious coffees and teas. I know that I like a lighter roast coffee and was not sure which one to choose and the company did a great job and choosing Armando's Blend and Morning Commute coffees for me to try out. Also, I was very generously send a bunch of peppermint tea to try as well. Since I got the package later in the evening, I knew that it was too late for caffeine so I made a cup of the peppermint tea. It it a tasty and caffeine free. It is made of fresh peppermint leaves from Oregon. The tea could be drank hot or cold. In the winter, I like to have a cup of decaf tea every evening and this one would be perfect to drink. It is not too minty and has a more mild flavor. Now onto the coffee! On Saturday morning, I brewed a cup of the Armando's Blend coffee. It was delicious! I just added some 2% milk and enjoyed it without any added sweeteners. They consider this coffee to be their number 1 blend. It uses beans from Central America, Indonesia, and Africa. It is a medium roast and is slightly sweet with a medium undertone. I loved it! Sticky Toffee Caramel Creme- yum! What's nice about this company is that they have so many different blends for your different preferences. I'm sure that every coffee lover could find a kind that they love. Also, Crimson Cup coffee and tea would make a fun Christmas gift. It could be a stocking stuffer or part of a gift basket!